The words and teachings of Elder Boyd K. Packer, who was serving as President of the Quorum of the Twelve when he died July 3, 2015, after nine decades on this Earth, are preserved in several books, including three treasures published in the past three years by Deseret Book. 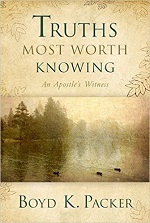 Truths Most Worth Knowing: An Apostle’s Witness is a timely tome, considering it was in the process of being published when Elder Packer passed away. His passing gives his words that much more impact as we reflect on a life well lived. This compilation of material from Elder Packer’s General Conference addresses, Church Education System and BYU devotionals, firesides, and Ensign articles of the past decade offer personal stories, examples, and even bits of humor on durable, artistically laid out pages. The powerful testimony of an Apostle rings through each chapter. President Boyd K. Packer of the Quorum of the Twelve celebrated his 90 th birthday this year, and he’s still calling it as he sees it. 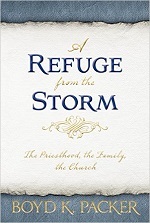 His words continue to direct and inspire an increasingly complex world in A Refuge from the Storm: The Priesthood, the Family, the Church, new from Deseret Book. By his own description having lived a long time and traveled widely (2.5 million miles) across the world, he echoes a familiar refrain that harks back to the home and the way priesthood and church are intertwined with family. Briefly referencing scriptures, Church history, and a few personal experiences, President Packer typically but unapologetically offers more counsel than narrative in these 24 chapters under the three headings outlined in the subtitle. It’s a spiritual how-to guide. 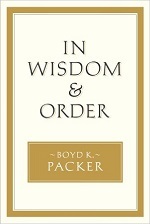 Boyd K. Packer borrows a phrase from King Benjamin for the title of his new book In Wisdom & Order (Deseret Book 2013, 260 pages in hard cover, $25.99). It’s a collection of 28 talks from General Conference, CES firesides, mission presidents’ seminars, and funerals over a quarter century. The book appeals to audiences of various ages, from youth to parents to mature members of the Church. The author quotes snippets of poems and hymns he’s recited in talks, as well as words from other General Authorities. A real treasure of this collection is the talks he gave at the funerals of Presidents Benson, Hunter, and Hinckley, as well as his Ensign biography of Spencer W. Kimball. The origin of each talk is given in a footnote on the first page of each. Also helpful is a good index.